Executive Homes Hua Hin offers this Property For Sale in West Hua Hin near Black Mountain golf course at a very low price. Are you looking for charming Hua Hin property for sale? This lovely private pool villa is for sale in West Hua Hin, conveniently located within a nice development very close to Black Mountain golf course and to the bypass. 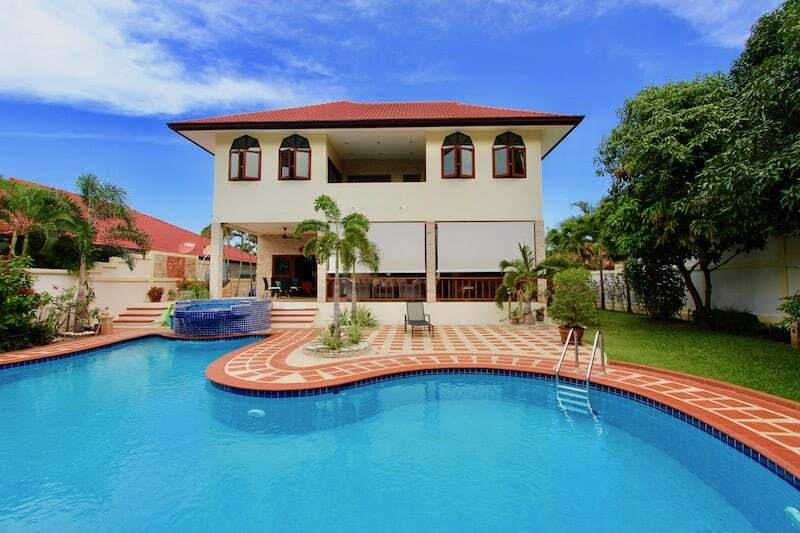 This Hua Hin home for sale is perfect as a holiday home or as an investment property for someone looking to generate consistent rental returns. The home is brand new and is sold fully furnished with high quality furnishings and a nice, modern built-in entertainment center. There is a European style kitchen with high quality appliances and granite countertops. The covered terrace has a spacious dining area, complete with ceiling fans for your comfort. There are fly screens throughout the house on the doors and windows and ceiling fans in most rooms. In the main house there are 2 bedrooms and 2 bathrooms, and there is a separate guest house with large bedroom, en suite bathroom and wardrobe. There is also a good sized storage and utility room, as well as a guest/pool toilet. The home has a covered car port. The development has 24 hour security and a nice coffee shop and cafe on site, and the location is only about 2 km to one of the best golf courses in all of Asia!